Hat: One size fits most women. Scarf measures approximately 6" x 71". RED HEART® “Soft Yarn”, Art. E728 (5 ounce/256 yard ball): 1 Ball each No. 3720 Lavender CA, No. 2541 Blue Sky CB, and No. 4601 Off White CC. Crochet Hook: 5.5mm [US I-9]. Yarn needle. 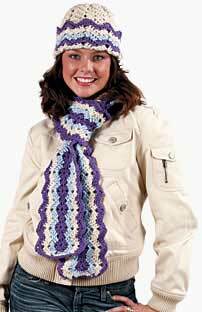 GAUGE: 14 sts (2 repeats) = 31/2"; 6 rows = 4" in pattern. CHECK YOUR GAUGE. Use any size hook to obtain the gauge. CL2: Yo and draw up a lp in next dc, yo and draw through 2 lps, skip next 2 sc, yo and draw up a lp in next dc, yo and draw through 2 lps, yo and draw through all 3 lps rem on hook. CL3: Yo and draw up a lp in next st, yo and draw through 2 lps, skip next 3 sts, yo and draw up a lp in next st, yo and draw through 2 lps, yo and draw through all 3 lps rem on hook. Shell: (2 dc, ch 3, 2 dc) all in st or sp indicated. Rnd 1 (Right Side): Sc in 2nd ch from hook, * ch 1, skip next 2 ch, shell in next ch, ch 1, skip next 2 ch, sc in next ch **, sc in next ch; rep from * across, end at **; turn to work on opposite side of beg ch; sc in same ch as last sc; rep from * across, end at ** changing to CB in last sc; join with a sl st to first sc  40 ch-3 sps on each side. Rnd 2: With CB, ch 1, sc in same sc as joining, sc in ch-1 sp, ** ch 3, dc in next 2 dc, shell in ch-3 sp, dc in next dc, * CL2, dc in next dc, shell in ch-3 sp, dc in next dc; rep from * across first side; dc in next dc, ch 3, sc in ch-1 sp **, sc in next 2 sc, sc in ch-1 sp; rep from ** to ** across next side; sc in last sc changing to CC; join. Rnd 3: With CC, ch 1, sc in same sc as joining, sc in next sc, sc in ch-3 sp, ** ch 3, skip next 2 dc, dc in next 2 dc, shell in ch-3 sp, dc in next dc, * CL3, dc in next dc, shell in ch-3 sp, dc in next dc; rep from * across first side; dc in next dc, ch 3, skip next 2 dc, sc in ch-3 sp **, sc in next 4 sc, sc in ch-3 sp; rep from ** to ** across next side; sc in last 2 sc changing to CA; join. Rnd 4: With CA, ch 1, sc in same sc as joining and next 2 sc, 2 sc in ch-3 sp, ** ch 3, skip next 2 dc, dc in next 2 dc, shell in ch-3 sp, dc in next dc, * CL3, dc in next dc, shell in ch-3 sp, dc in next dc; rep from * across first side; dc in next dc, ch 3, skip next 2 dc, 2 sc in ch-3 sp **, sc in next 6 sc, 2 sc in ch-3 sp; rep from ** to ** across next side; sc in last 3 sc; join. Fasten off. With CC, ch 4; join with sl st in first ch to form ring. Rnd 1: Ch 3, 13 dc in ring; join with sl st in top of ch-3  14 sts. Rnd 2: Ch 3, dc in same st as joining, [2 dc in next dc]13 times; join  28 sts. Rnd 3: Ch 3, [2 dc in next dc, dc in next dc] 13 times, 2 dc in last dc; join  42 sts. Rnd 4: Ch 3, [2 dc in next dc, dc in next dc] 20 times, 2 dc in last dc; join  63 sts. Rnd 5: Ch 1, sc in same st as joining, * ch 1, skip next 2 dc, shell in next dc, ch 1, skip next 2 dc, sc in next dc **, sc in next dc; rep from * around, end at **; join in first sc  9 ch-3 sps. Rnd 6: Sl st in sp, sl st in next 2 dc, ch 3, * shell in ch-3 sp, dc in next dc, CL2 **, dc in next dc; rep from * around end at ** and working 2nd leg of CL2 in first dc of previous rnd; join in top of ch-3. Rnd 7: St in next 2 dc, ch 3, * shell in ch-3 sp, dc in next dc, CL3 **, dc in next dc; rep from * around end at ** and working 2nd leg of CL3 in first dc of previous rnd; join. Rep Rnd 7 four more times. Fasten off. Brim-Next Rnd: With WRONG SIDE facing (this will be the right side when brim is turned up), attach CA in 2nd dc of shell; ch 3, * shell in ch-3 sp, dc in next dc, CL3 **, dc in next dc; repeat from * around end at ** and working 2nd leg of CL3 in first dc of previous rnd; join. Fasten off. Rep last rnd 6 more times in following color sequence: [CB, CC, CA] twice. Weave in ends. ABBREVIATIONS: beg = beginning; CA, CB, CC = Colors A, B, C; ch = chain; dc = double crochet; lp(s) = loop (s); mm = millimeters; pat = pattern; rep = repeat; rnd = round; sc = single crochet; sl st = slip stitch; sp(s) = space (s); st(s) = stitch (es); yo = yarn over; * or ** = repeat whatever follows the * or ** as indicated; [ ] = work directions in brackets the number of times specified.